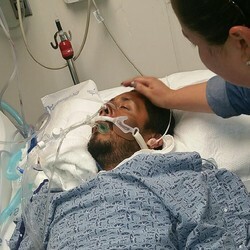 The family of Vincent Valenzuela III, a homeless man with mental health conditions, ended life support a week after an incident with Anaheim police left him in a coma. Drawing eerily similar comparisons to early reports on the Kelly Thomas fatal beating by Fullerton police, Valenzuela died 5 years to the day Thomas passed away from his injuries. What exactly happened to Valenzuela in the parking lot of a West Anaheim 7-Eleven on July 2 remains elusive. Anaheim police remain tight-lipped, only saying that they received a call that morning about a suspicious man following a woman to her home and that they "activated" a Taser, although they still won't say if they used it. "Valenzuela engaged the officers in a physical confrontation, and while the officers were attempting to take him into custody, he went into medical distress," the department's press release claimed.